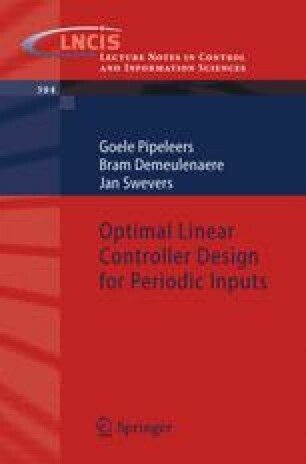 This chapter presents the general design methodology for controllers facing periodic input signals and elaborates on its fundamental concepts.The subsequent chapters apply this methodology to specific control strategies from the literature and hereby yield a more concrete impression of its functionalities and potential. The design methodology starts from the general control configuration, see e.g. [13, 131, 163], which constitutes a universal way of formulating control problems. Section 2.2 details this control configuration together with the required a priori knowledge of the periodic input. Fundamental to the methodology is its multi-objective nature, combining improved closed-loop periodic performance with additional design specifications. Section 2.3 elaborates on the formulation of multiobjective control problems and defines the periodic performance index, the mathematical means to incorporate good periodic performance in the controller design. The efficient and reliable solution of the resulting multi-objective design problem relies on the benefits of convex optimization (Section 2.5), where the convex reformulation of the controller design problem is enabled by the Youla parametrization (Section 2.4).